A bumper crop of sweet potatoes. 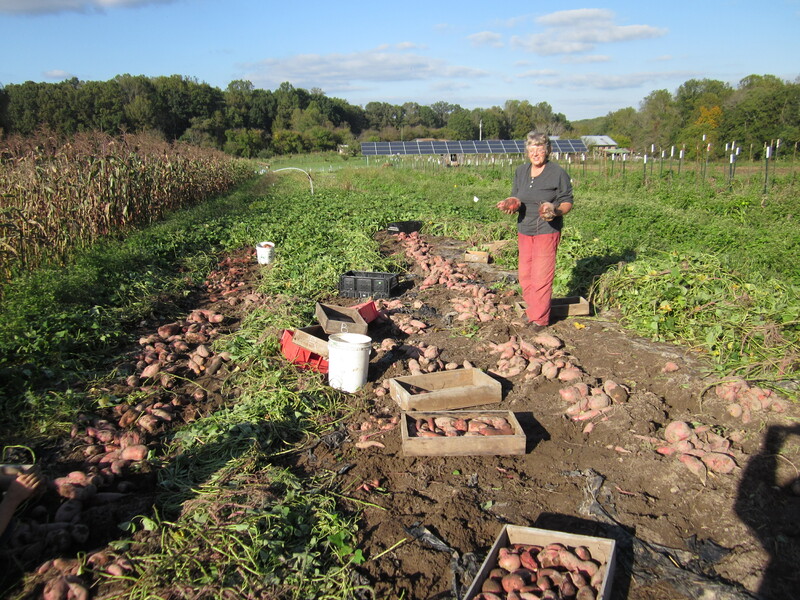 After a week of drizzle, it finally eased up and we started harvesting our sweet potatoes. I wrote a lot about this topic last year, so I won’t go into many details here. As usual, we set the dug roots in clusters, so we could see which plants yielded most and chose medium-sized roots from those to grow our slips next year. 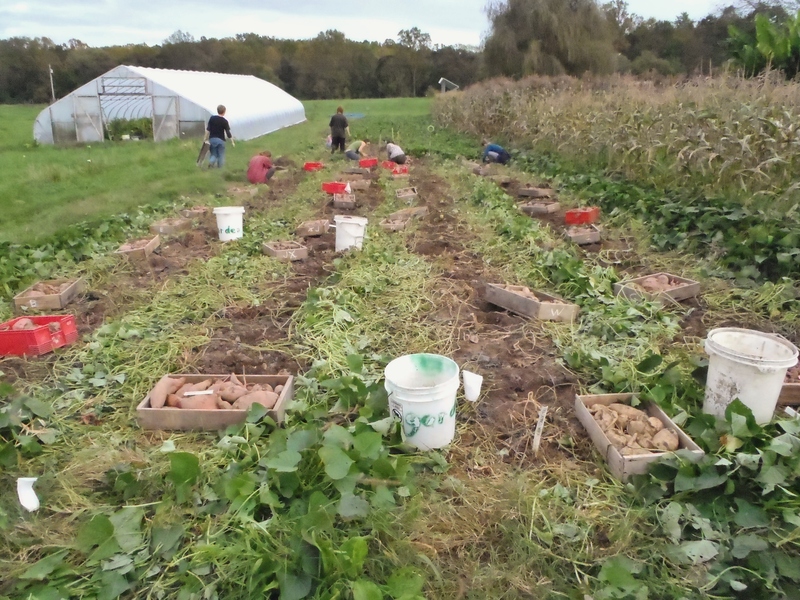 In the picture above, we are crating the sweet potatoes after someone has gone through selecting the seed roots. In the right background you can see our grid-linked solar array. In the left background is our hoophouse, and to the left is our dying last sweet corn planting. We have one last picking today, from the Silver Queen at the far end. We used a low electric fence around this patch to keep the raccoons out, and either it worked, or the beasts didn’t notice this planting. We didn’t get any visits from tigers or elephants either! Also visible in the photo above are remaining bits of the bioplastic biodegradable mulch we used. It’s made from non-GMO corn, and is great for warm-weather loving vining crops. This year, the Georgia Jet seem more productive than the Beauregard – I think that’s usual. We dug about a third of the crop the first day and got 86 boxes. The second day we had a lot of other harvesting (beans and broccoli being the most time-consuming), so we only dug another 36 boxes. We’re still only 45% of the way down the patch, so we could end up with 250 or more boxes. Probably the yield will taper off closer to the end of the field as the deer were browsing on the vines all summer. Friday update: Well, we finished harvesting yesterday, and the yield dropped off a lot where the deer had been browsing (memo: fence out the deer in future!) We got a total of 177 boxes of various sizes, perhaps about 3939 pounds, almost two tons. That’s not a record-breaker, but is second best in the past ten years. Our yearly harvest of sweet potatoes has varied a lot, from 31 boxes (a sad year) to 243 in 2009. An average over ten years of 112 boxes, each weighing perhaps 23 pounds. We grow about 800 row feet. We always hope to have enough to last till the beginning of May, when people start to lose interest in sweet potatoes, and start hoping for tomatoes. Now I’ve glided smoothly into the statistics section of this post, so I’ll tell you some figures for my book sales while I’m at it. New Society has sold 3320 to mid-September, from a 5000 print run. They say the book is selling well, not many returns. At Twin Oaks we’ve sold 150 of the 250 we bought in February when it came out. I’ve just set up an Author Page at Amazon, so I can tell you they have sold 940 print copies up till 10/6. They also provide me with ranking info (this could get addictive if I let it!) and my book was #40,116 when I looked. That sounds pathetic till you realize that’s out of 8 million titles. Anyway, enough vanity! As far as its usefulness to readers, having an Author Page means that if you go to Amazon, to my book page, and then click on my name, you can read my bio, and see my upcoming events, and get back to this blog. Getting perspective on the bookselling world, I was encouraged to learn that there is being a resurgence of small booksellers, despite the Big Online One. Here’s a link to the story in the Christian Science Monitor in March this year. I learned about it from Wendy Welch of the Little Bookstore at Big Stone Gap, who I met at the Festival of the Book in Charlottesville. She has written a memoir about her bookstore, called The Little Bookstore of Big Stone Gap, which you can buy via her website, or, I’m sure, at her store. And now on to this Inspiring story: At the Mother Earth News Fair I met a young woman of 12 who had borrowed my book from her library. She got inspired and decided to start market gardening. She succeeded in clearing $6000 in her first year, when she was 11! Here’s our list of tasks for October. If you garden in zone 6 or 7, your list might be similar. If you live in a very different climate zone, leave a comment about your list for October, and how many weeks different your area is from ours. 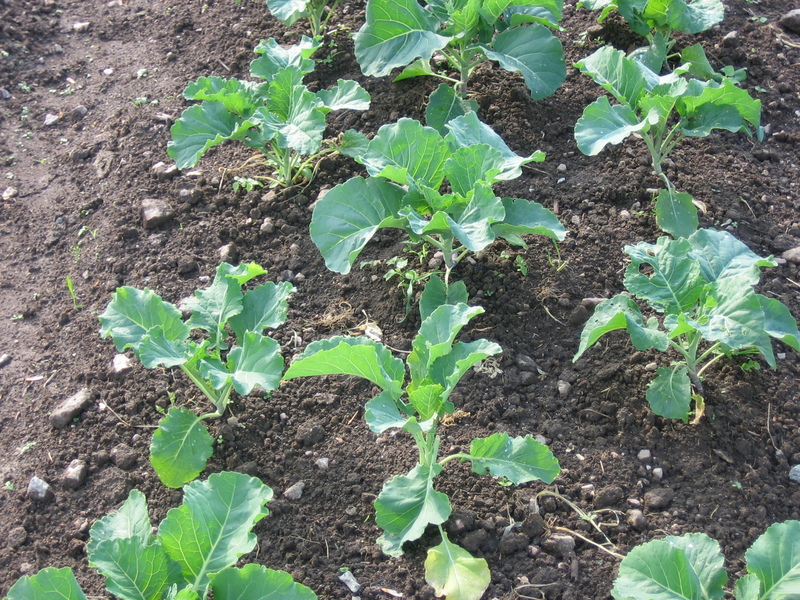 Weed and thin fall crops in raised beds, especially spinach and kale. Thin carrots to 3”, kale to 12”. Lettuce Factory: Transplant sowing #37 to fill cold frames; #38, 39, 40, 41, 42 in Greenhouse beds (9″ spacing). Harvest peppers facing the sky, tomatoes, cauliflowers, corn, cowpeas, limas, eggplant, melons, cukes, okra, winter squash, Blues cabbage (hardy to 25°F), if not already done. Double hoop and cover: lettuce, celery (hardy to 16°F with row cover). 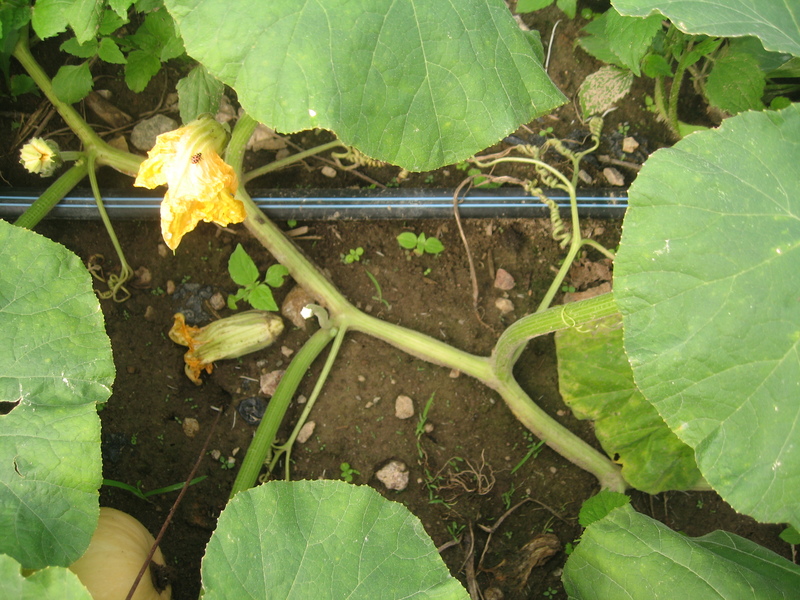 Spring hoop and cover: squash, cucumbers. 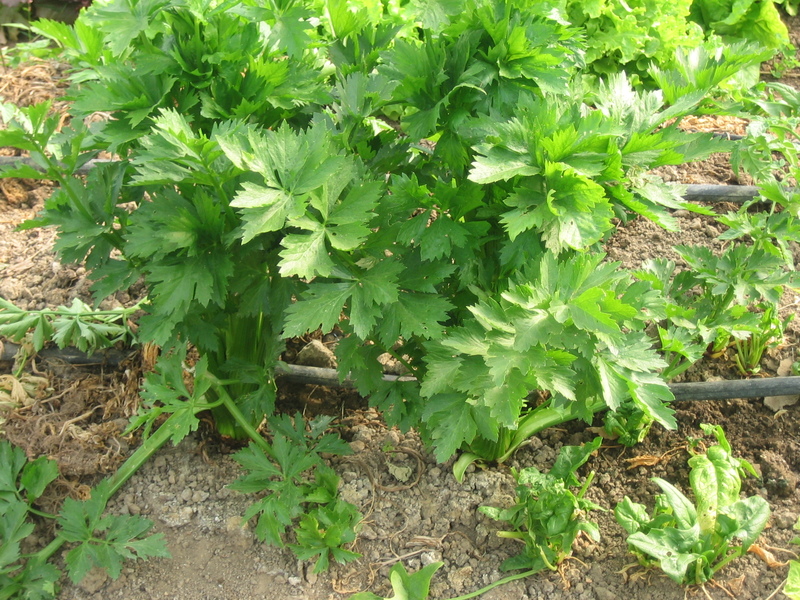 Cover celery to extend the harvest into mid-winter. We like Ventura. Rowcover (no hoops): beans, Chinese cabbage, pak choy, Tokyo bekana, seedlings for hoophouse, collards (hardy to 10°F, but cover keeps quality). Cold frames: Row cover between 32-28°F. Add lids between 28-15°F. Add quilts below 15°F. Foliar spray greens with seaweed a few days before frost, to toughen them up. 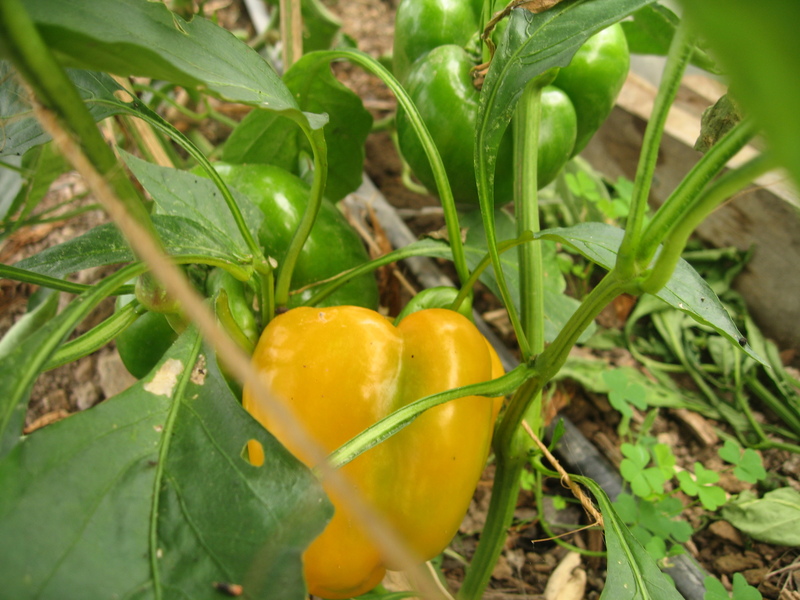 Use overhead irrigation on peppers & tomatoes at night and some raised beds with tender crops. Early Oct: Finish sowing spinach, kale by 7th for overwintering (last chance). Transplant lettuce #37 to fill cold frames; #38, 39 in Greenhouse (9″ spacing). Roll up drip tape from winter squash and sweet potatoes. It’s time to roll up the drip tape from the watermelon, winter squash and sweet potato patches, in preparation for disking and sowing winter cover crops. Move stored garlic from basement to fridge – store below 40°F or above 56°F, never 40-50°F. Mid Oct: Till finished raised beds and sow wheat or rye before the end of the month. Garlic Beds: Compost (5-6 tractor buckets), till and prepare beds. Transplant lettuce #40, 41, 42, 43 in Greenhouse as needed, filling any gaps. Get soil tests done, when soil is not too wet. 5th fall disking: By mid-month disk and sow cover crops where possible. Sow wheat or rye as covercrops – too late for oats or most clovers (Austrian Winter Peas Sept 15-Oct 24). Could sow winter wheat mid-Sept to early Nov (good for small plots that are hard to reach with the tractor) and after sweet potatoes). Harvest peanuts mid-late Oct after a light frost. Wash, dry, cure 6 days in solar dryer facing east (don’t heat over 85°F), store. 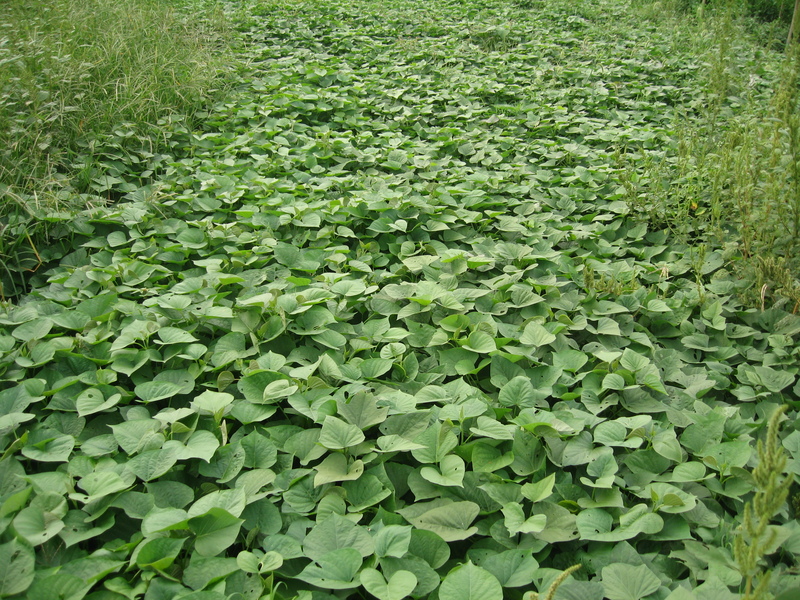 A well-covered sweet potato patch. 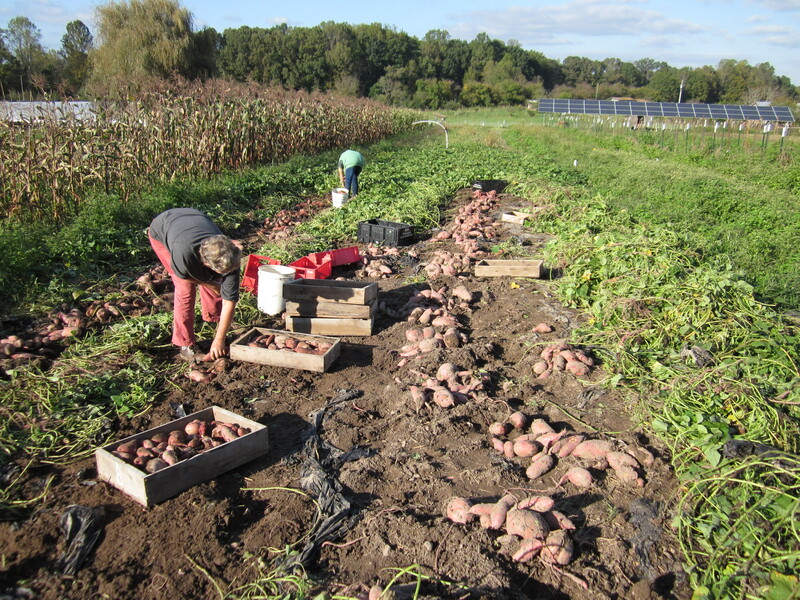 Harvest sweet potatoes before soil temps go much below 55°F, or night air goes below 50°F: on 3 mild days – generally in the week that first frost usually occurs (10/7-14). Even a few hours exposed to temps below 50°F will cause chilling injury. (Frost on the leaves does not of itself damage the roots). Clip vines, dig carefully, set tubers in plant-clusters to dry on the soil. Select seed tubers (med-size tubers from high-yielding plants). Save 100 Georgia Jet, 100 Beauregard, 20 each White and Jubilee. Cure in boxes with wood spacers and cover with newspaper, in basement with furnace going full time, for 7-10 days (85-90°F, 80-90% humidity). Use fans. Splash water on floor. Curing is complete when skin is undamaged after rubbing two together. Restack boxes in storage cage. Harvest white potatoes before the first frost (average Oct 14) if possible. Cure in root cellar at 60-75°F for 2 weeks, with good ventilation, then cool the cellar to lower temperatures: 50°F by 10/31, then 40°F for the winter. Late Oct: Transplant lettuce #44, 45, 46 as filler in Greenhouse. Double hoop and cover spinach. Planning: List successes & failures from labels. Prepare Garden Planning Schedule, Crop Review Sheets. Clean labels after info is recorded. Pray for a killing frost. File crop record info. Audit labor budget and plan endgame. Plan main garden layout. Hold Crop Review meeting. 6th fall disking: After the killing frost, or end of Oct if no frost: pull up tomato stakes and roll up drip tape, disk nightshades, melons, winter squash, sweet potato and white potato patches. Check through veg in storage, squash once a week, white potatoes two weeks after harvest. Perennials:Last mowing of clover in grapes in early Oct, not too short, and not too late in the year. Weed & mulch strawberry beds, and remove extra runners. Renovate if not already done. Start weeding, fertilizing and mulching the blueberries, raspberries, rhubarb and grapes. Time to say goodbye to the rhubarb until April. October Harvests: Asparagus beans, beans, beets and beet greens, broccoli, cabbage, cantaloupes, carrots, cauliflower, celeriac, celery, chard, Chinese cabbage, collards, corn, cow peas, cukes, edamame, eggplant, horseradish, hot peppers, kohlrabi, komatsuna, leeks, lettuce, limas, maruba santoh, okra, pak choy, peppers, radishes, Roma paste tomatoes, scallions, senposai, spinach, tatsoi, tokyo bekana, tomatoes, turnips and turnip greens, winter radishes, winter squash, yukina savoy, zucchini. 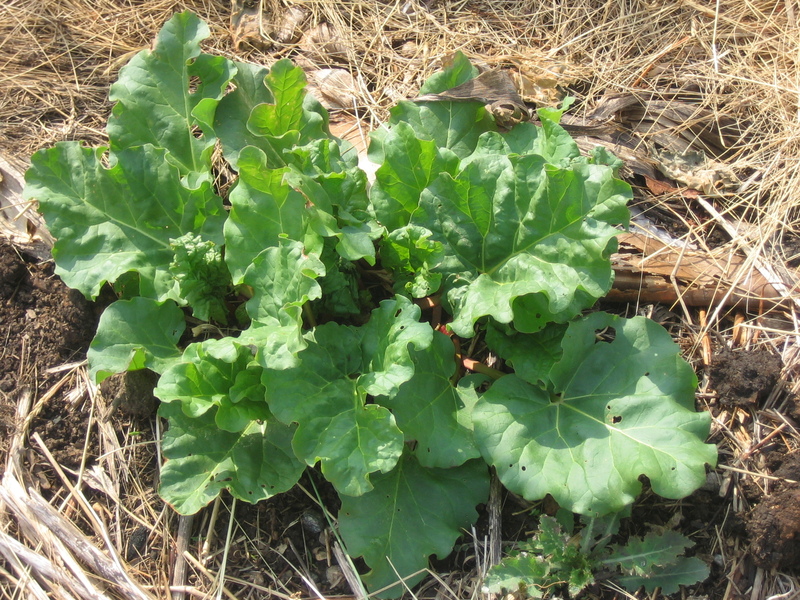 Could lightly harvest rhubarb before frost. Home from Asheville, potatoes planted, more rain and cold weather.